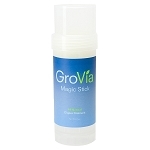 Grovia Magic stick is formulated with organic ingredients formulated to help with mild diaper rash or redness. 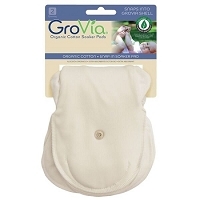 GroVia Itty Bitty Magic Stick Diaper Balm - Great for the diaper bag! GroVia Itty Bitty Magic Stick is the perfect diaper balm to take it with you on errands or trips because of its small size. The no-mess applicator keeps hands clean and the all-natural formula is effective for a variety of uses, including chapped skin, diaper rash, cuts and scrapes. Itty Bitty Magic Stick is colorless, organic, and petroleum-free. Plus, it smells amazing! To Use: Use as needed with diaper changes and at night before bed. Apply to clean, dry skin. (We recommend each child in your household have their own Magic Stick to prevent possible transfer of irritation. We cannot ship this product outside of the U.S.A. except for military addresses. This stuff is great to just have in the diaper bag, and it's awesome to not get your fingers dirty. Not my favorite scent - I don't like tea tree and it smells like that to me - but it helps and is a great barrier. Awesome gift basket addition for sure! This isn't my favorite diaper cream that I've tried, but the consistency is good (not too thin or too greasy) and this size is perfect for an easy use in the diaper bag. This is the perfect size for on the go or a spare. I personally just scrape off a bit with my finger so as not to apply directly to bottom but great size and works great.